Noise Pollution man-made noise harmful to health or welfare. Transportation vehicles are the worst offenders, , railroad stock, trucks, buses, automobiles, and motorcycles all producing excessive noise. 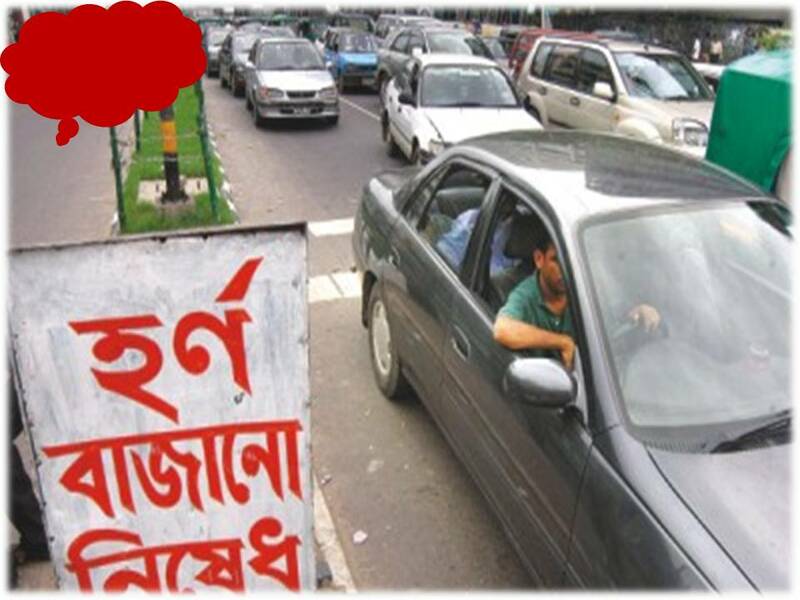 In Bangladesh noise pollution (also termed as sound pollution) is a major health hazard. In fact, due to noise pollution millions of people in Bangladesh are exposed to a number of health risks - from deafness to heart attack. On city streets noise pollution can be caused by hydraulic horns of vehicles, microphones and cassette players. The hydraulic horns used by buses, trucks and scooters in the crowded city streets are dangerous for human being. This is also how noise pollution in Dhaka City is affecting the hearing power of thousands of children everyday. The horns especially cause serious damage to children. Experts say, if a child below three years of age hears a horn emitting 100 dB of noise from a close range, he or she might lose his or her hearing power. A child's health may also be adversely affected by loud sounds from the radio, television, cassette players and microphones, the sound of mills and factories and loud noise.